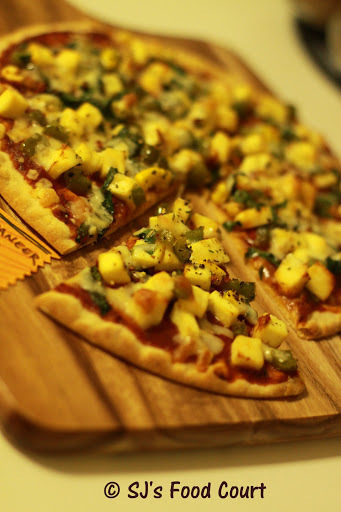 Expressions on my husband’s face were worth-watching when I told him that I was making a ‘Spinach-Paneer Pizza’!!! He definitely doubted to have a delicious dinner that time… :P But when he grabbed a 1st bite, I saw a big smile on his face… It was just too yummy to have! – Heat a teaspoon of olive oil in pan. Add paneer chunks with a pinch of salt and kitchen king masala into it. Toss it well with spices. – Turn off the heat in a min and transfer to another bowl. Let it cool down to room temp. – Chop the spinach into strips and add it into bowl along with boiled corn. Mix everything well. – Take a soft-pizza base and spread 1/2 cup pizza sauce evenly over it. – Arrange 1/2 of the topping mixture onto it. – Sprinkle 1/2 cup pizza cheese over it and then kasoori methi. Repeat the same process for another pizza. – Bake them in preheated oven for around 12-15 mins on 200 degrees. – Blanching: It’s a cooking technique where an element is kept into boiling water for around 2-3 mins. Follow the same process for spinach. Drain excess water after that and rinse with chilled water to retain the green color or spinach. Very unique recipe :) Lovely clicks !! 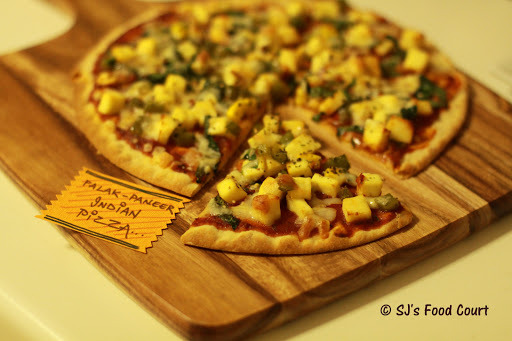 Great, I didn't think that We can make pizza with palak and paneer at home. nice.